It's taken more than a decade for Deltron 3030 to follow up their self-titled hip-hop concept record, but fans who waited patiently through multiple delays for a sequel to the cult classic won't be disappointed. 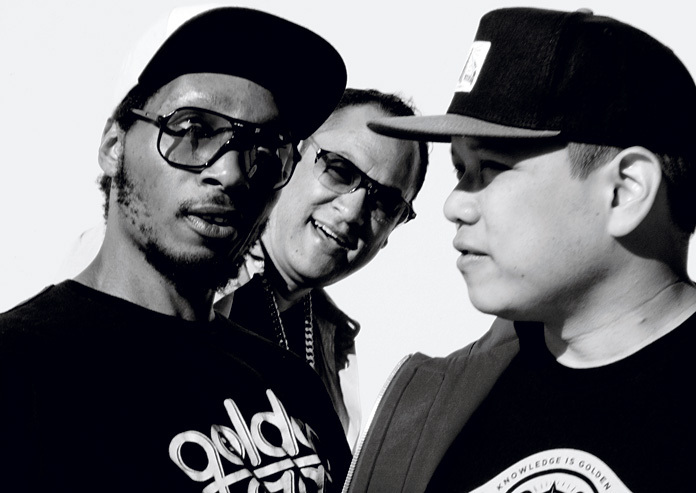 Producer Dan the Automator, turntablist Kid Koala, and rapper Del the Funky Homosapien have titled their new record Event II; it follows the further adventures of the characters debuted on Deltron 3030. "Ten years have passed since 3030, and there's been a lot of change in their world," says Dan the Automator. "The Deltron crew have been traveling and trying to survive through all of the turmoil. This is essentially their musical diary of life in the year 3040." The new record brings aboard even more guest stars than the original, from friends and former collaborators such as Mike Patton, Damon Albarn, and The Lonely Island to actors such as Joseph Gordon-Levitt, David Cross, and Mary Elizabeth Winstead, among others. The most audible change from the first record is the group's production style. For Event II, Deltron 3030 didn't use any samples, choosing instead to record original music with real musicians. "It's set in a post-apocalyptic era one thousand years in the future, so in a way we were finding futuristic sounds that also sound broken," says Kid Koala. "A lot of the synthesizers that we used inherently had ghosts in them, because they were on their last legs as we were using them." While a decade has passed within the record's post-apocalyptic setting, a full 13 years have gone by in the real world since the first album was released. All three members were occupied with other projects during the interim, and it was some time before Del was ready to return to the record's futuristic universe. "To tell you the truth, it wasn't where my interest was for the last 10 or 12 years," says Del. "My interest wasn't in sci-fi. My interest was in actual life. I just didn't want to fantasize; I was trying to think real. It just took a while for me to really be in a comfortable enough place to sit back and fantasize about other worlds." Although Del's acrobatic wordplay and its cinematic backing give the record a flavor similar to its predecessor, Event II has a much darker vibe. The future portrayed on this record is bleak: wars rage between planets, all financial structure has collapsed, class disparity is out of control, and survivors are forced to defend themselves from marauders. "It's fairly heavily based on observations of what's going on in society now and over the last 10 years. A lot of things that have happened in the real world are reflected here," says Dan. "When we were thinking about making this record, we went from 9/11 to Occupy Wall Street and banks collapsing. Those were all prominent thoughts in our minds at one point or another." "It's not like I directly correlated what's happened on Deltron II to those things," says Del. "Things that happened in our world overseas, like wars, and conflicts, and hunger, the different crises that we have. I just take my cue from there." Despite its real-world inspirations, Deltron 3030 are quick to clarify that Event II is not specifically a political record. "I don't want to call it reactionary, but all of that stuff helped give something to think about," Dan says. "What are the repercussions of those things in the year 3040?"